Blackwood , known as Lightwood in E. Tas. Dense pale yellow heads, globular of 30-50 flowers on stout stalks. Large erect tree or large shrub. Good shade tree and shelter in windbreaks. Useful in controlling erosion as it has a vigorous spreading root system and improves soil fertility. It suckers readily or regenerates from seed after disturbance such as fire, ploughing or ripping making it useful for rehabilitative works. 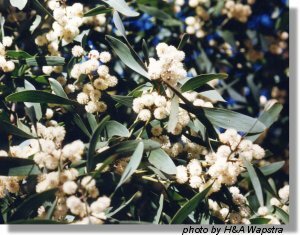 Resistant to livestock damage., but young plants are very susceptible to wallaby browsing etc.Resistant to Phytophthora cinnamomi. Susceptible to browsing by hares and rabbits.Koori (mainland) use: The fine hard wood was used to make spearthrowers and shields. Fibre from the inner bark was used to bathe rheumatic joints. The bark and twigs were reputedly used to stupefy fish, enabling easy capture. The gum is edible. Not suitable below powerlines. Pour boiling water over the seed and allow to soak for 24 hours before sowing. Alternatively boil the seed for about 10 secs before plunging it into cold water and sowing. Most Acacias are readily propagated by seed. Cuttings are possible with "phyllode bearing" Acacias, more so than with "feathery leaved" species.